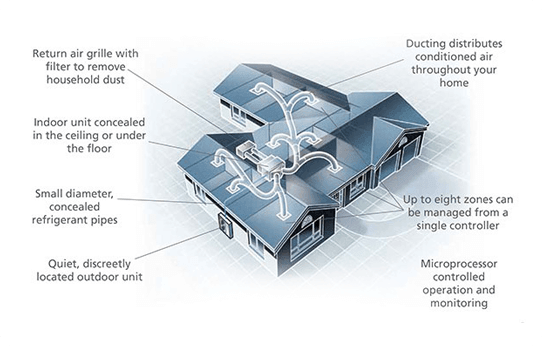 What is Ducted Refrigerated Air Conditioning? Ducted Refrigerated Air Conditioning is the best form of air conditioning available on the market. It includes both heating and cooling, runs solely on electricity, and is a whole home solution using inverter technology. A condenser unit is positioned outside your home, connecting to a series of ducts that distribute the refrigerated air through your home. Ducted Refrigerated Air Conditioning provides refrigerated heating and cooling throughout your Melbourne home with a comfortable temperature all year-round, regardless of the weather conditions. It does this while filtering the air and removing humidity. Heating is provided economically by ‘reversing’ the operation of the air conditioner. Instead of expelling the hot air and circulating cool air, it does the reverse – hence the term ‘reverse cycle’ air conditioning. What Are The Running Costs With Ducted Refrigerated Air Conditioning? One of our recommended brands for Ducted Refrigerated Air Conditioning is Mitsubishi Electric. For a Mitsubishi Electric PEAD-rp125jaa Series 12KW Ducted Refrigerated System, installed to provide a whole home regular heating & cooling during the winter and summer periods, the annual running cost would be measured at $1,340.05. *Data is based on: 2016 Victoria Energy Tariff of 32.1 c/kWh, using a Mitsubishi Electric PEAD-rp125jaa Series 12KW Ducted Refrigerated System collected from Sustainability Victoria’s Energy Consumption and Running Costs website. Usage times were set on average to 4 months of heating, and 2 months of cooling based on 7 hours a day. Actual running costs are affected by many factors including climate and insulation; this data should only be used as a guide and does not guarantee your individual running costs will reflect these results. It doesn’t take much to reduce your running costs with Ducted Refrigerated. Depending on the model you purchase, and it’s respective star rating will determine how much you can save annually. However looking beyond the initial cost to how you use your Ducted Refrigerated system can help as well. Why Choose Ducted Refrigerated Air Conditioning? Ducted refrigerated air conditioning provides quiet, unobtrusive climate control. Heat is distributed during winter, while cool air is circulated during summer. Coldflow is the leader for heating & cooling in Melbourne. Our qualified application engineers will advise you on the best system to fit any size requirement for home or business. Inverter technology is your key to year-round comfort, whatever the conditions. By more precisely controlling the compressor rotation speed, this technology provides high-speed heating, cooling and comfort with extra energy savings compared to non-inverter models. Our ducted residential heating and cooling systems are completely flexible, and can be customised for any application. We suggest you consider superior brands such as Mitsubishi and Daikin for their energy efficient advanced inverter technology. For more details regarding what products are most suitable for your home, call us at 1300 880 688 or click here for a free quote from our highly experienced thermo dynamic sales specialist at Coldflow.